When I received the table of contents of the incoming Statistics & Computing and saw a paper by V. Maroufy and P. Marriott about the above, I was quite excited about a new approach to mixture parameterisation. Especially after our recent reposting of the weakly informative reparameterisation paper. Alas, after reading the paper, I fail to see the (statistical) point of the whole exercise. Starting from the basic fact that mixtures face many identifiability issues, not only invariance by component permutation, but the possibility to add spurious components as well, the authors move to an entirely different galaxy by defining mixtures of so-called local mixtures. Developed by one of the authors. The notion is just incomprehensible for me: the object is a weighted sum of the basic component of the original mixture, e.g., a Normal density, and of k of its derivatives wrt its mean, a sort of parameterised Taylor expansion. Which implies the parameter is unidimensional, incidentally. The weights of this strange mixture are furthermore constrained by the positivity of the resulting mixture, a constraint that seems impossible to satisfy in the Normal case when the number of derivatives is odd. And hard to analyse in any case since possibly negative components do not enjoy an interpretation as a probability density. In exponential families, the local mixture is the original exponential family density multiplied by a polynomial. The current paper moves one step further [from the reasonable] by considering mixtures [in the standard sense] of such objects. Which components are parameterised by their mean parameter and a collection of weights. The authors then restrict the mean parameters to belong to a finite and fixed set, which elements are coerced by a maximum error rate on any compound distribution derived from this exponential family structure. The remainder of the paper discusses of the choice of the mean parameters and of an EM algorithm to estimate the parameters, with a confusing lower bound on the mixture weights that impacts the estimation of the weights. And no mention made of the positivity constraint. I remain completely bemused by the paper and its purpose: I do not even fathom how this qualifies as a mixture. Michael Jordan, Jason Lee, and Yun Yang just arXived a paper with their proposal on handling large datasets through distributed computing, thus contributing to the currently very active research topic of approximate solutions in large Bayesian models. The core of the proposal is summarised by the screenshot above, where the approximate likelihood replaces the exact likelihood with a first order Taylor expansion. The first term is the likelihood computed for a given subsample (or a given thread) at a ratio of one to N and the difference of the gradients is only computed once at a good enough guess. While the paper also considers M-estimators and non-Bayesian settings, the Bayesian part thus consists in running a regular MCMC when the log-target is approximated by the above. I first thought this proposal amounted to a Gaussian approximation à la Simon Wood or to an INLA approach but this is not the case: the first term of the approximate likelihood is exact and hence can be of any form, while the scalar product is linear in θ, providing a sort of first order approximation, albeit frozen at the chosen starting value. Assuming that each block of the dataset is stored on a separate machine, I think the approach could further be implemented in parallel, running N MCMC chains and comparing the output. With a post-simulation summary stemming from the N empirical distributions thus produced. 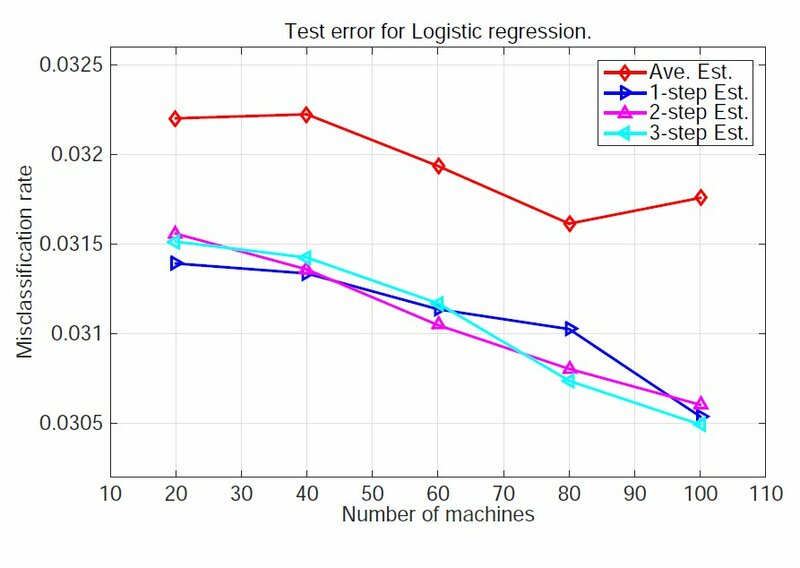 I also wonder how the method would perform outside the fairly smooth logistic regression case, where the single sample captures well-enough the target. The picture above shows a minor gain in a misclassification rate that is already essentially zero.